More Tasers and an increased emphasis on talking it out during a disturbance rather than using force: That's the gist of the reforms announced today by Mayor Rahm Emanuel and interim police Superintendent John Escalante in the aftermath of last weekend's deadly police shooting. The mayor calls them some of the most significant changes in the history of the police department, acknowledging they’ve come up short in recent years and had to look to other departments for best practices. The changes announced today include de-escalation and mitigation techniques; better verbal and communications skills; 30 days of desk duty for officers involved in a shooting; doubling the amount of tasers from 700 to 1,400 at a cost of $500,000; and training all beat cops to use Tasers by June 2016. Emanuel acknowledges, however, that Tasers alone won’t solve the problems of police misconduct. 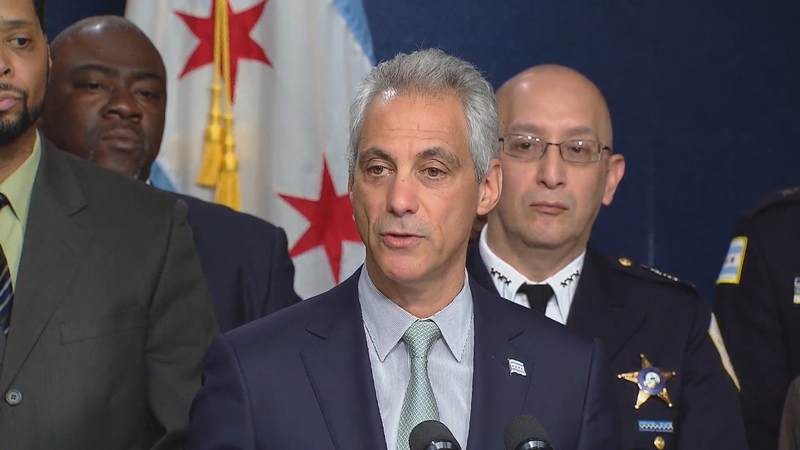 Mayor Rahm Emanuel and interim police Superintendent John Escalante, right, announce police reforms. Tasers certainly aren’t seen as a cure-all. There are many officers who say they don’t always work; there are other incidents where Tasers have become deadly when the victim had an underlying condition or if the cop was abusive. State Rep. Mary Flowers (D-Chicago), who co-sponsored a bill that would allow for the recall of the mayor, says she believes Tasers are a way of papering over the real problem. “Tasers kill also, just like guns. If there’s abuse and misuse, there’s the same problems with tasers as there are with guns,” Flowers said. Superintendent Escalante said that the point of the police department policy changes is to expand training for officers on what to say in situations to bring down the heat rather than revert to force. It’s all about changing the mindset of officers to one where the use of deadly force is a last resort. The changes come in the wake of a police-involved shooting that took the lives of 19-year-old Quintonio LeGrier and his 55-year-old downstairs neighbor Bettie Jones, who police acknowledge was accidentally and "tragically" shot. Police had been responding to calls of a domestic disturbance between LeGrier and his father, Antonio LeGrier. The younger Legrier was said to have been threatening his father with an aluminum baseball bat and wielding the bat when authorities came to the door and allegedly opened fire, according to both LeGrier and Jones’ family members. The incident was immediately referred to the Independent Police Review Authority, which is investigating. Meanwhile, we reported last night that officers who have been involved in fatal police shootings are still on the job. Jason Van Dyke is charged with first-degree murder and is suspended without pay, but he is still officially a member of the Chicago Police Department. Van Dyke must go through what could amount to months of hearings in front of the Chicago Police Board before they make a final determination. Dante Servin is also still with the department despite former police Superintendent Garry McCarthy’s action to move and fire him. Servin was acquitted of manslaughter for shooting and killing an innocent bystander, Rekia Boyd, at a party. A judge said he should have been charged with murder. He too will have to go through a series of police board hearings that could take seven months or more before a final determination is made on his employment. We asked Emanuel today why it is so hard to fire a police officer, and he referred to the convoluted process involving the Independent Police Review Authority, the Chicago Police Department and the Chicago Police Board that must occur before an employment termination can take place. He says his appointed task force on police reform will attempt to change that. Today marks the mayor’s first appearance since returning yesterday from a holiday family trip to Cuba. Last weekend's police-involved shooting has raised questions about whether Chicago officers are equipped to deal with mental health crises.